Bluebird Broadband is proud to announce we are now offering Internet service in Pelican, LA and surrounding areas. Bluebird Everywhere is the newest addition to the Bluebird family of products. 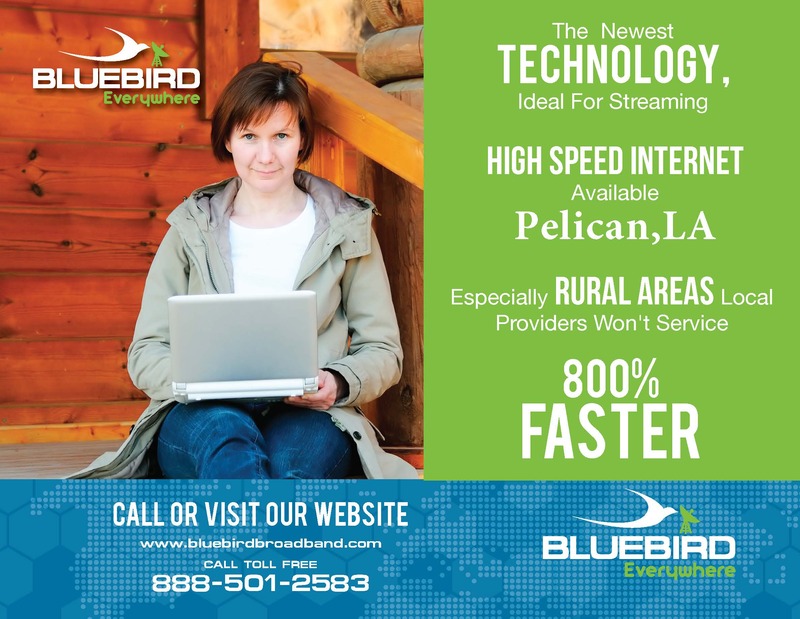 With so many customers in rural areas seeking Bluebird Broadband’s services, there are often times that these requests come from outside our coverage area. Bluebird now has access to the latest generation Internet satellite and the service offerings are far better than any that have been available in the past. With speeds up to 12 Mb x 3 Mb and much higher data caps, this service was created to meet today’s demand for streaming video and large downloads. Other satellite services actually forbid streaming and offer less than half the speed of this new service. There are even plans that allow unlimited internet surfing and email with the data cap only applying to streaming services. With Bluebird’s friendly, professional, and local, installation, service and support, Bluebird Everywhere can be a solid solution for those of you who enjoy rural living. We have a dedicated sales team that will help you select the perfect plan for your needs. Give us a call,because Bluebird is now Everywhere! Contact us today to find out about the benefits Bluebird has to offer your home. Or Call us 318.908.1000 to find the broadband solution that is right for you.